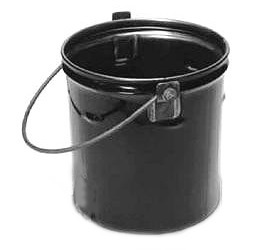 PRODUCT: Cleasby #B03300, 6-Gallon Hot Asphalt Service Bucket. Features 24-Gauge Steel, reinforced handle and Rolled Rim. Price/Each. DESCRIPTION: Buckets are uniquely designed with inset bottom and handle punched through the bucket, not attached at the side, so there are no welding points to pull apart.